This is a game between two teams have a good record in the Euroleague but with the hosts rock bottom of the group with a 1-5 record and the away team toiling with a 3-3 record, this may not be the flowing game of basketball that many would expect from these two sides. It is a game though that both teams are desperate to win, so it could be an exciting one. While Milan have tasted defeat on five teams this campaign, they do boast the top scorer in the Euroleague so far this season. This is because Alessandro Gentile has bagged an average of 20 points per game but Milan need other players to step up. The fact that Gentile has grabbed double figures in his last 16 Euroleague outings says it all about his consistency. If players like Jamel McLean and Stanko Barac can perform like everyone knows that they can, Milan would have a good chance of taking all the points in this game but the players have failed to stand up and be counted on many occasions this season. 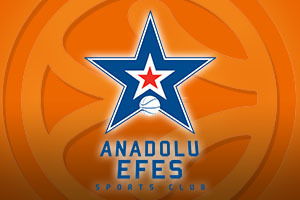 The away team can boast of a 5-5 record at the Mediolanum Forum and whenever Efes squares off against Milan, there is a recollection of the Korac Cup of 1996. That is ancient history for the current team though and the Turkish side will be keen to grab the win that will cement their chances of a Top 16 spot. With respect to some statistics, Anadolu haven’t been too bad, particularly with scoring where they are third, with 87 points per game, and assists, where they are currently ranked first with 20.8 assists per game. They do toil with respect to free throw shooting though. 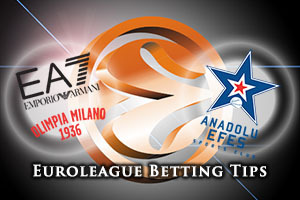 The away team are the favourites for this clash and taking Anadolu Efes Istanbul with a handicap of -3.5, and odds of 1.90, is likely to be a decent bet for Thursday night. When it comes to the Over/Under market, you’ll have an interest in going OVER 155.5 at odds of 1.90. Bet Now!